LITTLE VILLAGE — Two years after closing its doors, El Nopal Bakery is back in business with a former baker at the helm. "We have all of the same recipes," new owner Ozzie Ocegueda said Friday as he sold boxes of hojarascas, the beloved heart-shaped cookies that have drawn patrons to El Nopal for more than 60 years. Ocegueda teamed with baker Eugenio Vargas to reopen El Nopal at 3648 W. 26th St. on Friday. 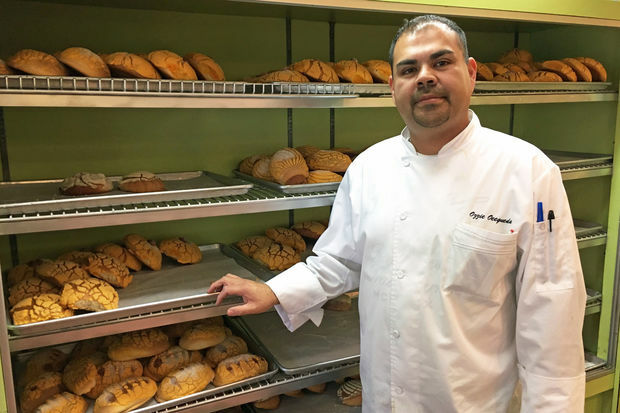 Vargas spent a decade baking for El Nopal before moving to Rosy’s Bakery down the street in 2015. He and Ocegueda bought El Nopal's classic recipes to deliver "a little of the old and some of the new," Ocegueda said. Husband-and-wife team Francisco and Celia Bonilla first opened El Nopal in 1954 on the Near West Side. The iconic bakery moved to Pilsen in the 1960s, and a second locale debuted in Little Village in 1974. Though the Pilsen bakery shuttered several years ago, son Frank Bonilla continued to run the Little Village shop after his parents' deaths. He announced his retirement in 2015 — and said he hoped someone would buy El Nopal to continue his family's legacy. Now, two years later, Ocegueda and Vargas are hoping to do just that. In a message Friday, Frank Bonilla said Vargas "will bake my father's recipes and also his own creations and cakes. ... [I am] no longer involved except to eat delicious pan dulce. I'm very happy El Nopal is in good hands, and I couldn't ask for better." A steady stream of customers trickled into the store Friday, with kids tres leches cakes and colorful pan de muerto. By 4 p.m., Ocegueda and Vargas had already sold more than 300 boxes of hojarascas, which retail for $7.50 for a box of 20. Customer Herbierto Gonzalez said he was excited to see El Nopal open Friday and he hopes his hojarascas "have the same taste." In a previous interview, Jaime di Paulo, executive director at the Little Village Chamber of Commerce, called El Nopal "one of the big anchors" in Little Village. It was "one of the big pioneer businesses in Little Village in the late 70s, early 80s," di Paulo said. "It's one of those [places] that made Little Village what it is, what it once was. ... People came here from across the Chicago area and the Midwest to buy their bread for many, many years." In coming weeks, Ocegueda has plans for a grand-opening celebration with a mariachi band and prizes. He is hoping to utilize some of El Nopal's space to launch a juice bar or create an area to buy yogurt and snacks, "something more modern."